But some medical providers say doctors should stay out of the debate. 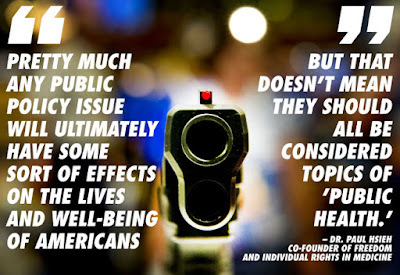 Dr. Paul Hsieh, co-founder of Freedom and Individual Rights in Medicine, says he views gun crime and violence as predominantly about criminal justice and individual rights. "I remain deeply skeptical of any attempts to frame important public policy debates as also 'public health' issues, especially when it concerns a long-running political controversy," says Hsieh, who writes on health care policy from a free-market perspective for Forbes.com. "Pretty much any public policy issue will ultimately have some sort of effects on the lives and well-being of Americans – but that doesn't mean they should all be considered topics of 'public health.'" People are concerned that sharing information about gun ownership with doctors may not remain private, he wrote in a Forbes piece. "In short, I believe this undermines the critical doctor-patient trust necessary for the good practice of medicine," he says. I thought they characterized my views fairly, and I was pleasantly surprised to see that they even turned the quote into one of the lead article graphics! The Power Of "I Don't Know"